Harvest Butter is a wonderful tasting fresh grass fed butter made with sweet cream that is produced when our cows are eating harvested hay and grains from fall to spring. Harvest butter is significantly richer than pale, waxy grocery store butters. You can see the quality of this butter in its rich yellow color and you can taste the difference in every bite. This is a seasonal butter only available from the fall to the spring of the year. 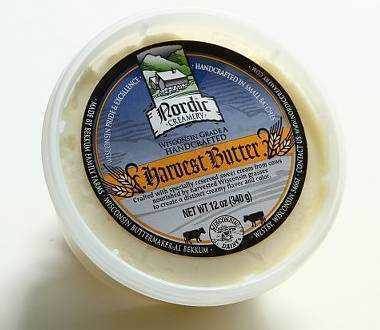 Nordic Creamery’s all-natural butter is certified rBGH free, and is made using cow milk from Wisconsin cows raised on natural grasses and feeds. This is simply the best butter I have tasted. A healthy and great tasting real food. Best Butter I've Found Yet! Found this at a local Woodmans for a very reasonable price for organic, grass fed butter! Tastes amazing! Since this is seasonal, I might have to buy a bunch and freeze them? Can I do that without harming the quality? Purchased this butter at Outpost Co-op in Milwaukee, WI. It is so flavorful, has a great mouthfeel and tastes awesome on everything! My co-op has inconsistent butter supply so I'm glad to see there are online options! Only butter I buy lately! This is delicious, and I am so glad to have found such a great, regionally-sourced grass-fed butter at Schnuck's in Springfield, IL. I even got one for each family member for Christmas. Service Area: Westby, La Crosse, Onalaska, Holmen, West Salem, Milwaukee, Madison, Fond Du Lac, Waukesha, Wisconsin Rapids, Eau Claire and surrounding communities.